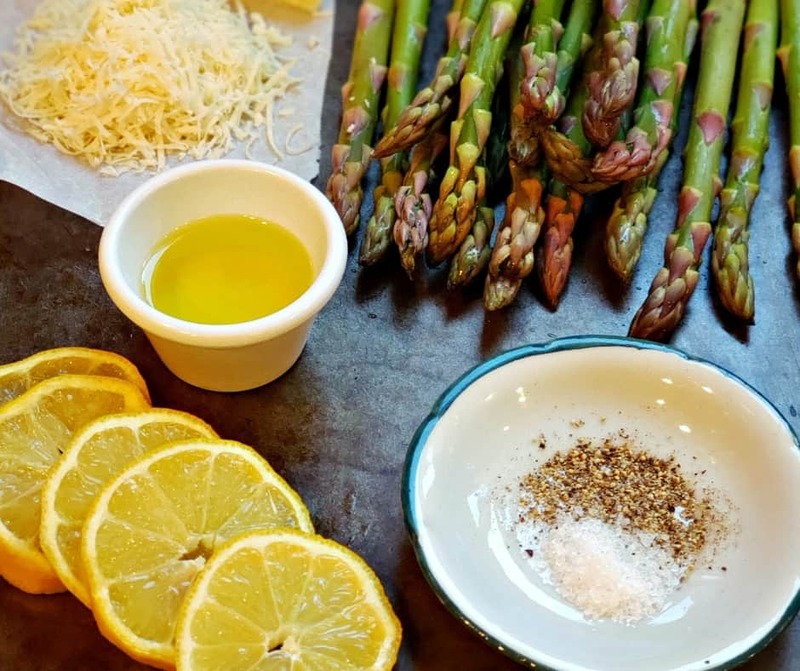 Lemon garlic asparagus with parmesan is an amazing side dish for any meal. Bonus? It’s low carb, keto, and THM friendly. 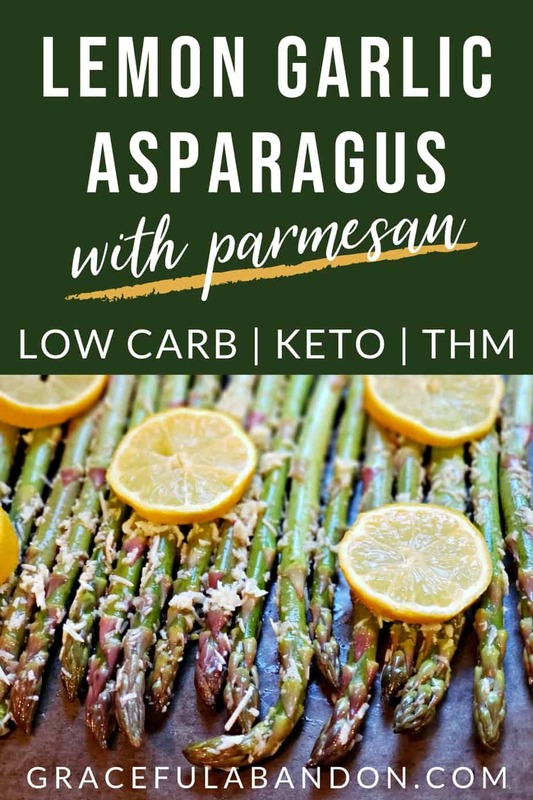 Match up this oven roasted asparagus with your favorite grilled meat for a simple summer dinner that’s healthy, family friendly, and low carb. Lemon, garlic, and parmesan are an amazing trio, and complement your crispy asparagus beautifully! Have you been searching for a refreshing, delightful, easy side dish to pair with some grilled chicken or your favorite steak? This lemon garlic asparagus is where it’s at. Seriously, lemon and garlic combine for a light summery flavor with the crunchy goodness of oven roasted asparagus. Sprinkled with parmesan, this low carb side dish is everything you could want. Even the kids will approve. 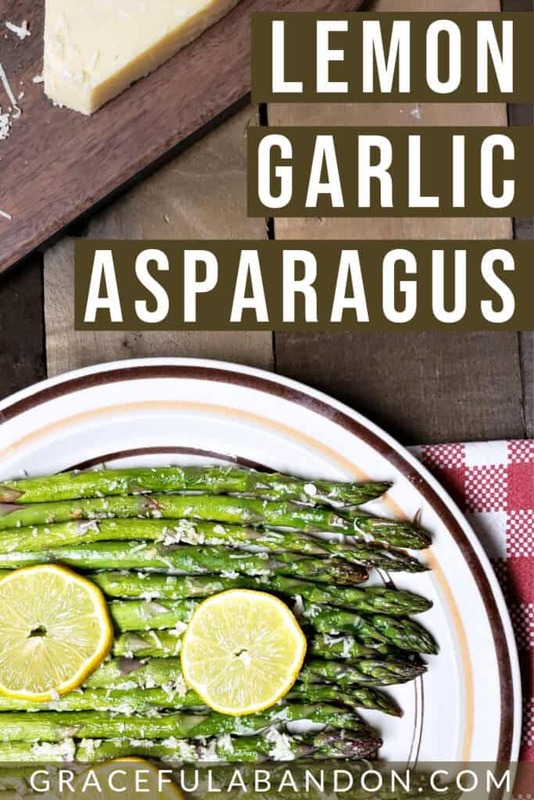 This lemon garlic asparagus is super easy, because all you’re going to do is prep it, season it, and stick it in the oven. 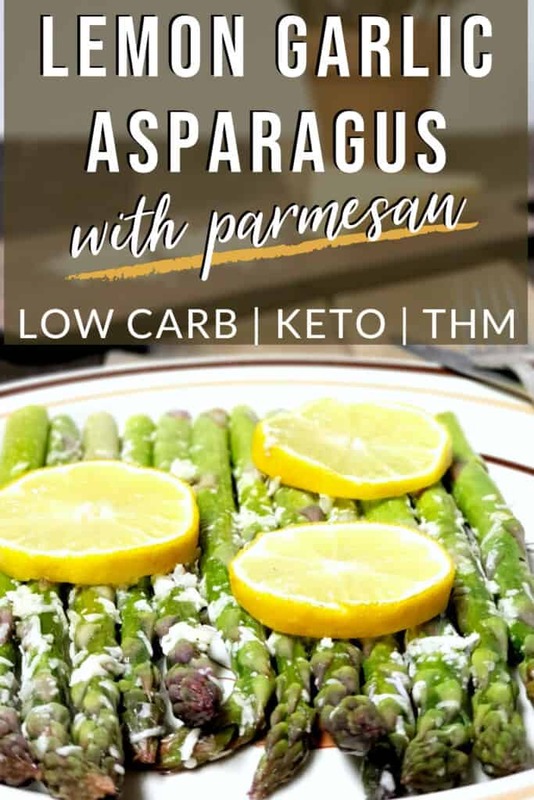 Oven roasted asparagus is a little easier the sautéed because you don’t have to babysit it as much, so this is bound to become a favorite keto vegetable side dish for you. Not sure how exactly to prepare and trim your asparagus? It’s really easy…don’t stress it. Be sure to lay it out on a paper towel or absorbent cloth to get rid of excess moisture. Now it’s time to get the flavors working together! 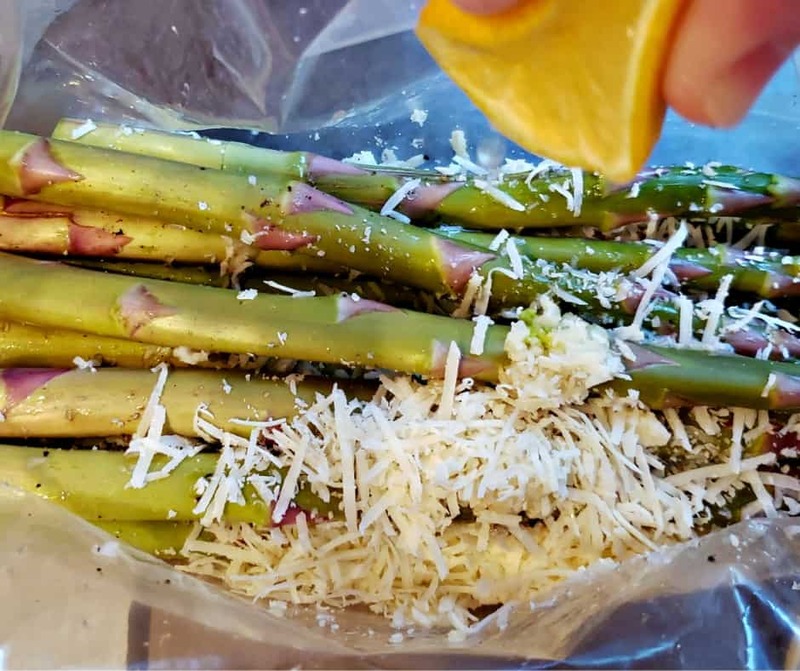 Combine salt, pepper, olive oil, parmesan, and the asparagus in a zippered bag. Squeeze the lemon top of it all and then seal. Gently massage the marinade into the asparagus or turn the bag to thoroughly coat it all. Spread your marinated asparagus onto an uncreased baking sheet (this baking sheet is my fave!) and cook at 350 for around 12 minutes. Your asparagus will be soft inside, but delightfully golden and crispy on the outside. Oven roasted asparagus perfection! This is a side dish best served fresh. It’s really good all on its own as a light meal or snack, or with your favorite grilled meat. If there happens to be any leftovers, they’ll keep in an airtight container for up to 5 days. The best way to reheat them is to bake them or stick them on a skillet. You can microwave them, but they won’t be crispy at all. 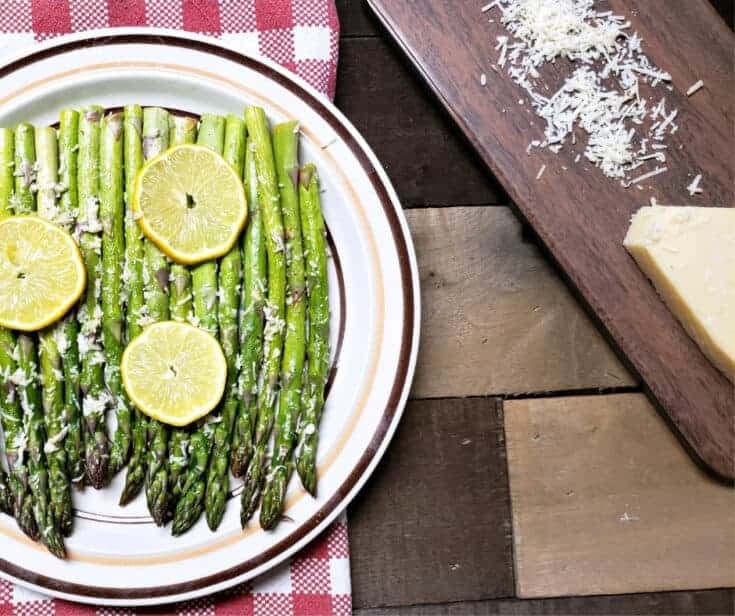 This oven roasted asparagus with lemon, garlic, and parmesan has the light, refreshing flavors of the Mediterranean and pairs beautifully with your summer grilled meats. Low carb, keto, THM.